Get your pencils and start… developing – useful design templates for iPhone, Android, Web apps! I’ve done a tiny bit of research to find nice templates, but the best one I found was by accident, while I was looking for something completely different on iPhone Dev Tips blog. The link was to a Russian redirection service, which took you to a PDF on Google Docs – look here, but if it’s not there anymore, I made a mirror just for you! My favorite. Simple, couple layouts, I think most interesting are the first one and the last one, which can work as a flow diagram. 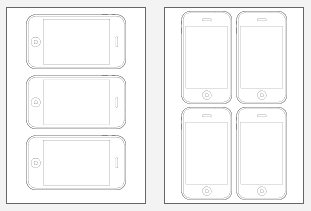 The original “single” iPhone wireframe picture can be found here. 10 free printable design wireframe templates. I used to just grab a screenshot of Firefox on an empty page, print it and draw, but this is pretty neat. Very nice looking, with extra space for notes, title, page numbers. Probably better, if you want to share your designs and want all the explanations there. Not the best, if you want to draw a lot of different views or you are experimenting – take the first template instead.